wohl einer der besten Coups und Schnäppchen, die Gladbach je machte. Unter Bernd Krauss konnte er dann seine Stärken im Organisieren einer Vierer-Abwehrkette zeigen, als zentrale Figur im Krauss-Experiment "Viererkette" einfach unersetzbar. Andersson besticht einfach durch perfektes Stellungsspiel, antizipiert Spielsituationen im Voraus und stellt den Gegner somit frühzeitig. In Eins-gegen-Eins-Situationen bleibt er fast immer Sieger, setzt seinen Körper geschickt ein und erkämpft ohne Foulspiel den Ball. Darüberhinaus spielt er kaum Fehlpässe beim Spielaufbau. Diese Fähigkeiten machen ihn zum Garanten für eine stabile Defensive. Seit Jahren ist er der statistisch zweikampfstärkste Spieler der Bundesliga...mit imposanten 80% gewonnener Zweikämpfe, einfach unglaublich und dies kontinuierlich seit ca. 5 Jahren. Andersson has a total of 96 caps for the Swedish national team, scoring three goals. He won a bronze medal in the 1994 FIFA World Cup. Andersson also played in the team which reached the semi-finals in the 1992 European Championship. He was also part of the Swedish national squad that took part in the Euro 2000, 2002 FIFA World Cup and was a member of the Swedish squad that competed at the 1992 Summer Olympics in Barcelona. In December 1992 he went professional as he moved to Blackburn Rovers for £800,000. His next step was to go to Germany and play for Borussia Mönchengladbach. 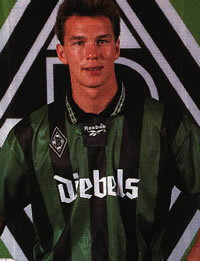 There he won the German Cup with the team in 1995, but left the team as its performance deteriorated, in 1999. The famous Bayern Munich became his next club. His time with Bayern resulted in two Bundesliga championships (in the 2000–01 championship season he scored the final and decisive goal against Hamburg in the last minute – his only goal for the club) as well as a German Cup and victory in the Champions League, despite missing his penalty in the final shootout. Andersson moved to Catalan giants FC Barcelona in 2001 and spent three injury-plagued seasons there. For the 2004 season, Andersson came back to Malmö FF to play in the Swedish league again after 10 years. This year he captained Malmö FF who won their first Swedish league (Allsvenskan) title in 18 years. He has twice been awarded Guldbollen as the Swedish footballer of the year, in 1995 and 2001. After suffering yet another knee injury during a Champions League qualifier against Swiss team FC Thun on 10 August 2005, Andersson announced his retirement from top level football on 12 August 2005.